What is Endodontics and when is an Endodontic treatment necessary? The most common need for an endodontic procedure is a deep cavity, however there may be other reasons as well, such as, traumatic lesions, prosthetic reasons, combinations of endodontic and periodontic lesions etc.. In order of better understanding what and why is an endodontic procedure necessary, a brief explanation of the tooth’s anatomy is in order. A normal tooth crown, (The part seen in the mouth), has three layers, the external one called enamel, an intermediate called dentin and the deepest one called pulp, (aka the “nerve”). See fig # 1. When decay attacks the external layer of enamel there will be no symptoms, the reason being that the enamel has no cells able to transmit a stimulus to the brain, and thus there is no response. 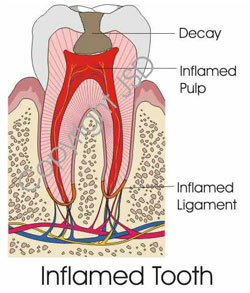 However, when decay invades the Dentin, (Second hard tissue layer of the tooth), patients may feel a fleeting discomfort to different stimuli such as cold, heat, sweets etc. (See fig. # 2). If left untreated the disease will progress and reach the PULP, (Also known as the nerve), (Fig 3), and at this stage the tooth will require an Endodontic treatment. Many times and for different reasons patients refrain from looking for help and the pulp becomes necrotic, (Dead), and infected. This infection my affect the surrounding tissues and end up as an Abscess, (Swollen face), or a sinus tract, (Fistula), or a gum boil. The Endodontic Treatment, (aka as a root canal), involves the removal of the affected tissue, proper cleaning, shaping and filling of this space, followed by a proper restoration. If these procedures can be achieved in a predictable manner the tooth should be able to function in a proper manner for a long term. Endodontics has seen a number of incredible changes in the last years which allow to obtain very predictable results in a comfortable manner. The introduction of the Operating Microscope, Cone Beam Computed Tomography, (CBCT), Nickel Titanium Rotary instruments and other technological advances have helped to dispel the notion that Root Canal Therapy is s a horrific experience. Even with the most advanced technological possibilities in our hands it is impossible to guarantee a 100% success rate in Endodontics, (Same applies for any other procedure involving Biology). If on the other hand, the procedure has not been performed following the minimum guidelines of standard of care, the case has a lower chance for success. If this is the case, and in the absence of any unusual complications, the case may be re-done. Different studies have shown that the long term prognosis is not as good as good as for a normal case, however, the odds are still good. Re treatment will involve the removal of the previous filling material, canals assessed to determine possible anatomical features such as additional canals, non-cleaned spaces etcetera, and to determine if these factors can be addressed, and if such is the case, complete the re-treatment. Presently we have a new technological advance called “CBCT” that stands for “computed cone beam tomography” that allows obtaining a three dimensional image of the tooth and in that manner determine with more certainty if the case should be retreated or not. If a failing endodontic case is not deemed a good candidate for a non surgical re treatment, there is a third alternative that can be assessed which is the Surgical Procedure. This procedure is reserved for those cases where the Endodontist feels that the disassembly of a previously treated tooth and subsequent re treatment may result in a worse situation than the one present. If that is the case, the patient is anesthetized, the gum covering the tooth’s root is separated from the subjacent bone tissue, and the root end is approached, the pathologic tissue removed, and a sealing product is placed from the outside toward the inside at the root end or other canal exit that may be involved as the reason of failure, and in such a manner as to allow a proper seal of the canal (s). There are a number of products and technologies available to improve the prognosis in these cases, but cases should still be carefully assessed in order of deciding if to proceed or not. 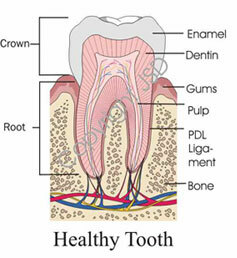 The most important aspect to be determined is the amount of supporting tissue available around the affected tooth. If the tooth does not have proper support or this support cannot be obtained by additional procedures, any treatment will be doomed to failure. Other factor affecting the decision are, but not limited to, caries extent, presence of incomplete crown root fractures, and very important, the strategic value of the tooth. If proper conditions are not present, or cannot be obtained, the best solution is to remove the tooth and replace it with an implant or another prosthetic device. All these conditions should be examined and the patient informed about in order of avoiding unpleasant subsequent events.